This data is then copied to the magnetic strip of a blank card. The fraudster then uses this information to withdraw money from your bank account, or even make purchases using your card details. When does card skimming take place? 1. The shop assistant takes your debit/credit card away from you to process the payment. 2. When you are asked to swipe your card in different POS machines. 3. When you notice something suspicious about the card insertion slot in the ATM machine. The slot appears wobbly and loose. 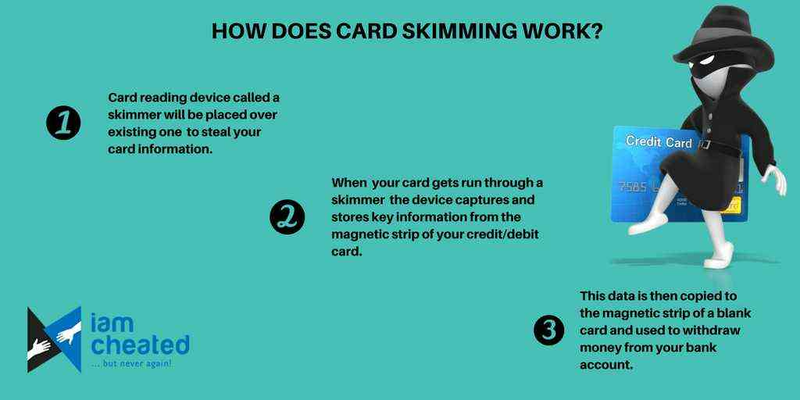 How to protect yourself from card skimming? 1. Make sure your card is swiped in your presence and do not share your personal identity number (PIN) with anyone. 2. Do not insert your card in an ATM machine, whose card insertion slot looks odd. 3. Use chip-based cards, as it has very good security features. 4. Monitor your bank account and credit card statements regularly. If you find any suspicious transactions, report it to your bank immediately. The safety of your debit and credit cards are in your own hands. It is your responsibility to take care of your cards and safeguard yourself from card fraud.